In an age of information overload, businesses around the world are realizing the importance of producing content as a means of truly engaging with the customer, gaining leads and ultimately sales. Are you one of them? You should be. Here’s why. Interruptive advertising is simply not working. You’ve experienced those annoying banner ads, right? Consequently, creating content that people choose to consume is becoming an increasingly attractive alternative for most brands. In fact, 86% of B2B marketers and 77% of B2C marketers are now using content marketing in a strategic fashion (Contently). Useful content is attractive for a global audience. So, why not maximize the reach of your content by setting a global content marketing strategy? But what is global content marketing exactly? Put simply, content marketing is creating useful, relevant and engaging information to help your customers make decisions. Global content marketing, then, is creating content that targets audiences across countries with the aim of acquiring new customers or increasing business from existing customers globally (Pam Didner). So, you want to develop a global content marketing strategy? You’re in the right place. In this article, I’m going to walk you through a 5-step process for creating a global content marketing strategy. Along the way, I’ll help you carve out your content marketing niche, enabling you to produce content that is desired, differentiated and effective. Let’s get started. A successful global content marketing strategy starts with deciding on the business goals you want to reach. This will also help you get the buy-in from key stakeholders needed to carry out your content marketing program (Contently). So, start by considering what you want to achieve: is it to build brand awareness? Drive more leads? Increase sales revenue? You may consider setting a broad overarching goal that is supported by a number of SMART objectives. 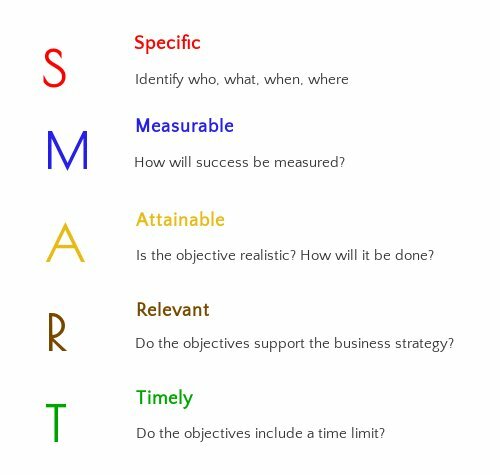 Set SMART objectives for your content marketing strategy. Be specific in identifying the geographical markets you are aiming to reach. Is it global, a specific region, or country? Also, be realistic. Does the nature of your subject make your content scalable? If not, I would suggest starting small and scaling later. Choose one or two core markets, test and refine your strategy in those markets, then scale later to other markets, adapting your content as needed. Once you have identified your objectives, consider how you will measure the effectiveness of your content marketing in meeting them. For this, you need to identify the KPI’s you want to measure. The exact KPI’s you select will vary depending on the type of content you produce, but some key ones are: number of leads, conversion rate, and page views. Content marketing is most effective when you understand – and write for – a specific audience. Identifying a specific persona for your content means you can create content that is relevant and valuable to them, enabling you to drive more interest in and conversions from the content you create (Convince and Convert). This is because personas help you to identify their interests and motivations and communicate with them on their own terms (CMI). Start crafting a content marketing persona by building up a picture of your prospect; draw a picture if it helps! Consider the template below for a typical B2B buyer persona. Answering these questions will help you identify the ideal content topics, types, and channels that will move your prospects closer to making a purchase. Take particular care to identify your ideal prospect’s pain points. A handy template for a typical B2B buyer persona. The number of buyer personas you create will depend on the number of distinct audiences you aim to target with your content marketing. If you are targeting B2B markets, it is possible that your buyer personas can be scaled globally as users have similar needs and motivations across international markets. This is unlikely to occur in B2C markets. In that case it would be wise to focus on one audience first; you can then create other personas once you have got your content marketing program off the ground (CMI). Once created, document your buyer personas to ensure everyone in your company has the same image of your audience and is creating content that is aligned to meeting their needs (CMI). This is especially important when executing a global content marketing strategy across international teams that may not be in constant contact. 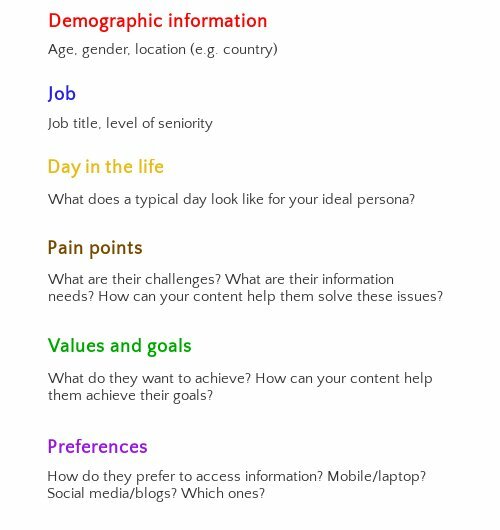 You can map your personas to the buying process for more strategic content creation. To do this, examine all the stages that you expect each persona to go through along their buying journey, and identify the objectives, activities, and informational needs they are likely to have at each stage. From there, you can plug in specific content ideas to reach prospects at each stage in the journey (CMI). For example, blog posts for the awareness stage, an e-book for the consideration phase, and a product demo video for the decision phase. 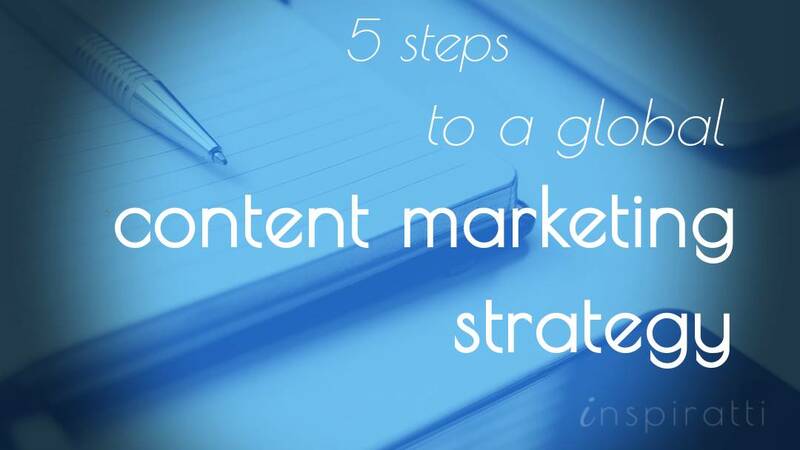 You have now arrived at step 3 in creating your global content marketing strategy. It is time to do some competitor research. Identify websites that are serving the same audience that you are trying to reach and compile a list of competitor sites. You can also do a quick online search by entering [your topic] + [blog] into google; review the search results to sift out those that are targeting the same audience as you. BuzzSumo is very useful for competitive research. Simply enter your topic into the search bar and you’ll get a list of the most-shared posts on that topic from a range of websites. Once you have compiled a list of competitor sites, review their websites, blogs, social media profiles, and content downloads. What topics are popular (i.e. high shares)? What topics are underserved? How could you create content that is better, or at least unique? Start by assessing your internal competencies. List those areas in which your organization has particular skill sets or knowledge. Conducting an audit of the existing content you produce for your home market is another helpful exercise to this end. It will also enable you to refine your existing content marketing for a global audience. 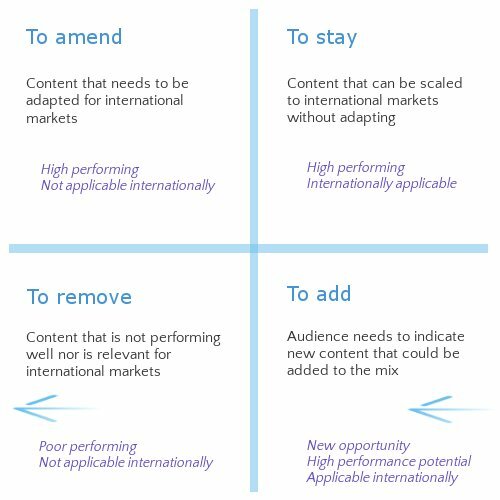 Drawing a content matrix is a really useful exercise that can help you pinpoint where to focus efforts in your global content marketing strategy. Identify the types of content you already produce, as well as plan to produce, in your global content marketing; this could be on the basis of format, topic or media types. Then slot them into the content matrix based on your research and forward strategy. Aim to create unique and high performing content that is aligned with your brand ethos and consumer needs. Say you are thinking of producing more videos as part of your global content marketing strategy, given that your videos have performed well in your home market (i.e. highest views/shares/conversions) but are underutilized in your industry. The next step is to consider which aspects you need to change/add/remove to make it suitable for international markets. Draw a content matrix to help pinpoint your content marketing focus. To complete this matrix accurately, you need to review the consumer and competitor analysis you conducted in steps 2 and 3. So, now let’s consider how these elements fit together. 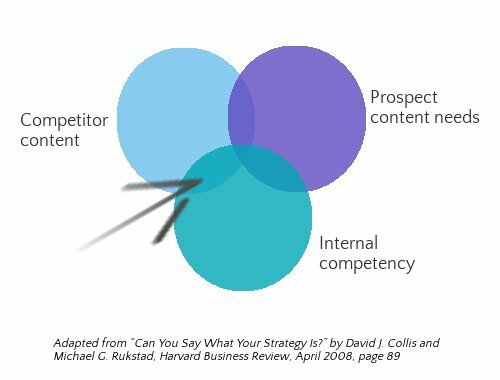 Essentially, you want to create content on topics you know about (internal competency), that your prospects want to know about (prospect content needs), and are underserved (a lack of competitor content in his area). Do you have specialist knowledge in an area that is demanded by the market but is hardly covered by anyone else? If so, hone in on that area. Identify your content sweet spot. What if there are no underserved areas in your subject matter? There are two options: 1. it needs to be better, or 2. it needs to add a unique angle. How can you create unique content? Ask yourself this question: how can you bring a new perspective to a popular subject area? For example, maybe you conduct original research in a topical area in your niche; incorporating this research into your content is a great way to add additional value. Beyond subject area you should consider type of media and length. Maybe your market is flooded with concise blog posts, but there are no in-depth eBooks? Or perhaps your subject area is overwhelmed with text content, but there are no videos? All the content you develop should support this missioning statement, regardless of where your content is in the buying process or what persona you are targeting. Essentially the missioning statement defines the core audience you are targeting, what you are delivering to your audience, and the outcome for the audience. This should be fairly simple to define from the analysis conducted in the previous stages. Ensure that everyone involved in the content marketing process has the missioning statement to hand. You may flesh this out further with a more detailed set of guidelines that can be shared across international teams. Setting standards for your global content marketing means your team (and readers) know what to expect. It ensures everyone in your team follows this approach in their writing so that all content retains that unique aspect that your readers will come to know and love. For example, you may differentiate your content by using a storytelling approach that draws upon your direct experiences. Similarly, guaranteeing that all content falls under a common theme helps build authority in that particular niche and ensures there are cross-links between your content. I’m not saying that you shouldn’t experiment with different types of content, rather that you should think strategically about what you are creating to derive maximum benefit from your efforts. The power of digital technology means the potential of reaching, influencing and converting global audiences has never been greater. And developing a smart global content marketing strategy plays a crucial role in achieving this end. So, don’t just churn out content. Take the time to think, research and plan. That way, you’ll be better equipped for producing content that doesn’t just reach audiences but also converts. In fact, you’re twice as likely to be effective with your content marketing if you have a written-out strategy (Forbes). This doesn’t mean your strategy should be static. It is a living document that needs to be constantly revised. Strategy involves making some difficult decisions, saying ‘no’ to some things and ‘yes’ to others. It’s deciding what you will focus on and how you will position yourself. So, the question remains: what will be the focus for your global content marketing strategy? It’s time to make some decisions and start creating content that has global impact. Share your thoughts on creating a global content marketing strategy in the comments. Hey Laura, thanks for your insight. I recently started blog where I share essence of books on areas of self-help and business. I think I must plan a global strategy as readers for this niche are scattered over globe. I will definitely look into it. Thanks again.